Is World Cricket Pay fair? In an article, published in “The Cricket Monthly” on 17 October 2017, the earnings of cricketers from the Test playing nations were compared. Among these comparisons were, pay by contract level (bottom, middle or top tier), the captain’s pay level and the coach’s pay level. 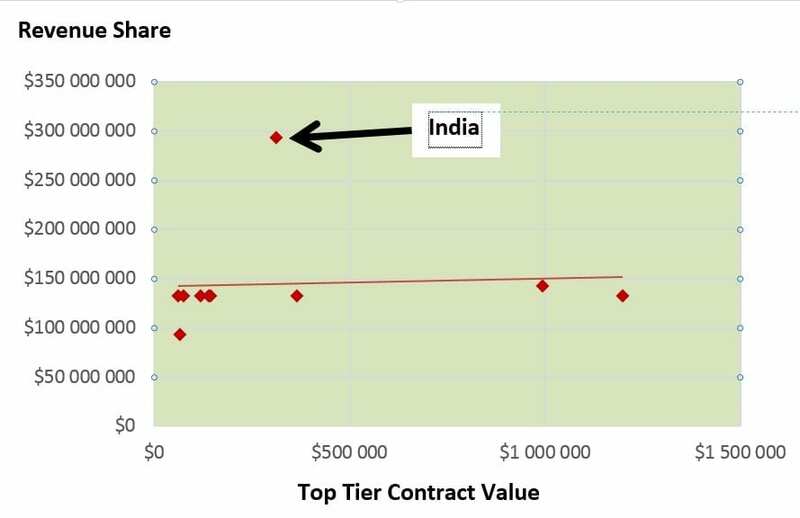 The article focused predominantly on comparing the pay levels of various countries and discussing anomalies eg: Irish top tier contracted players earning more than Pakistan’s top tier contracted players. The analysis contained data for both fixed pay (contracts) and variable pay (match fees for each format of the game – Test, ODI or T20). The focus of this article is not about the level of pay but rather around pay fairness or equity. Using the data presented in referenced article, we will test the internal equity of pay as well as the link between team pay levels and performance. Internal equity is the comparison of pay within a team whilst external equity is the comparison between team members between countries. External equity has no relevance as it will not influence a player’s “move or stay” decision because players’ are required to be citizens of a country before being eligible to represent that country. Internal equity can have a large impact on morale and perceptions within any work group, including sports teams. If individuals feel prejudiced or unfairly remunerated relative to their peers, this can cause feelings of prejudice. A recent example of this was when women tennis players were actively speaking out about their lower value prize money at tournaments relative to their male counterparts. The range of pay will be calculated to test the relative equity of pay between the fixed pay levels of each country’s national team cricket contracts. 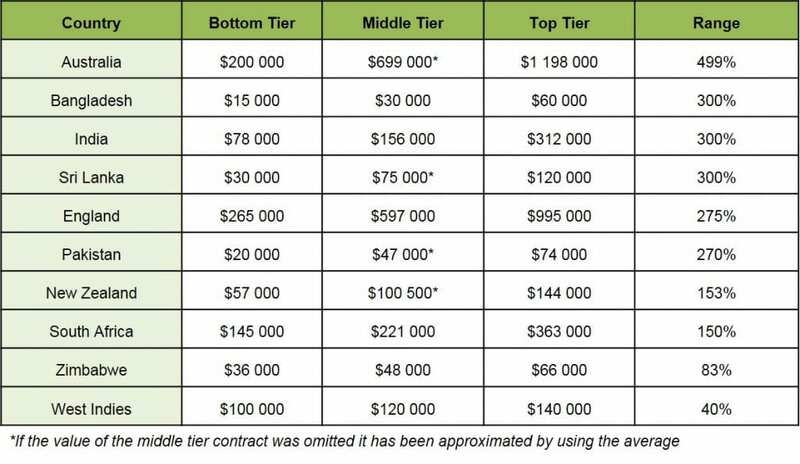 The pay range is shown in Table 1 and is a measure of how wide spread the pay levels of the fixed contracts are. The larger the range, the larger the inequality present between team mates at the top and bottom end of the fixed contracts. Australia tops the list with a range of 499%, followed by Bangladesh, India and Sri Lanka with ranges of 300%. It is interesting to note that the level of pay (value) and range of pay appear to be independent of each other and therefore pay philosophy on this element of pay is independent of the value of contracts. This means that the level of pay does not allow one to predict whether the team will have a larger or smaller range. However, they do not seem disproportionate based on tenure, as often bottom tier contracts are occupied by new entrants while, top tier contracts are occupied by seasoned masters of their craft. Similarly, the revenue share received from the International Cricket Council (ICC) does not have a significant positive relationship with the level of pay of the top tier contracts. The majority of cricket boards receive the same revenue over the course of the financial cycle, however India and England receive more with India earning substantially more than its counter parts. Conversely, Zimbabwe earn less than their counterparts. Figure 2 plots each cricket board’s top tier contract against its share of revenue received from the ICC. It is important to note that the revenue sharing model is not the sole source of all revenue received by any cricket board. Some cricket boards are able to raise significantly more revenue than others via sponsorships, hosting lucrative tournaments, endorsements etc. The same is true for the players, with some players earning significantly more than others as a result of sponsorships and endorsements. 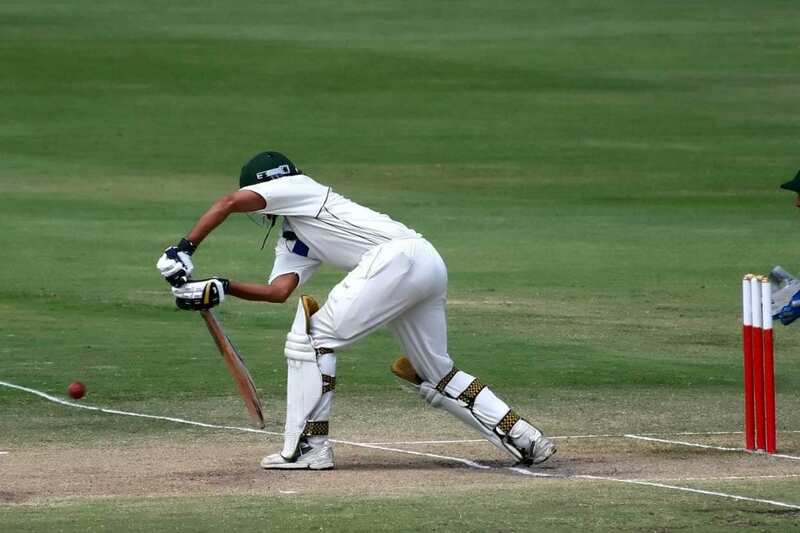 These additional factors are omitted from this analysis as the focus of this article is whether the countries’ cricket boards in general pay equitably and whether there is a link between pay and performance. Table 3 details the match fees earned by each teams’ players in each format of the game (Test, ODI or T20). The Indian cricket players receive the highest match fee for Test matches and ODIs. England pays the highest match fee for T20s. With the exception of Zimbabwe, South African cricket players receive the lowest match fee for T20s and ODIs. The ODI pay levels are somewhat disproportionate given that South Africa is the currently the best ODI team in the world. In contrast, South African cricket players earn the fourth highest match fees for a Test match. 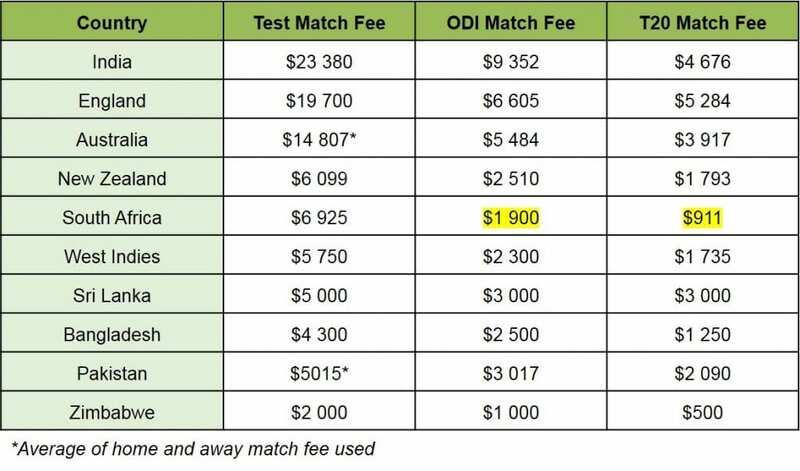 Plotting these match fees compared to these Teams’ ICC rankings points will determine whether there is a relationship between the match fees and their ranking points (performance). The upward sloping line indicates that there is a positive correlation between match fees and performance. An interesting trend is that the strength of the positive correlation increases as the length of the match increases (Tests have the steepest slope and T20s the flattest). This is perfectly in line with prior expectations as the chances of a shock loss for a top team increase as length of match decreases (A match is far more even over 3 hours compared to 5 days). Both the link between pay and performance and the larger fees being paid for longer assignments is consistent with what one would expect from a pay model. The link between match fees and team ranking in each format of the game was positive and significant – the shorter the match the larger the chance of an upset. What does this all mean? There appears to be internal equity in World cricket pay and that there is a good link between performance and pay – this is good practice and is often strived for in the business world. Maybe some remuneration lessons can be taken from World cricket pay!